Click the map image to enlarge. The City of Grand Rapids is working to make parking downtown easier. Check out the transportation resources below! 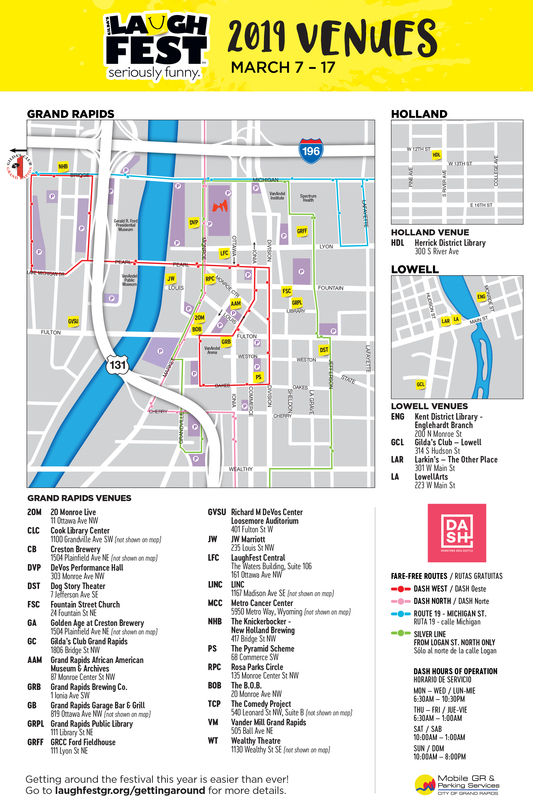 Downtown Parking and Mobility Guide – A digital guide which helps visitors find parking and other mobility resources, including information about the Rapid & DASH buses, parking, carpooling and much more. Motu App -The Motu app allows you to pay for metered parking using your mobile phone. Plus, you’ll get a notification when your meter is about to expire. You even have the option to add time to your meter — right from your phone! Available on iOS, Android and online. Transit App – The Transit App gives real-time upcoming departure times for transit, and allows users to star their favorite lines and stops to make frequent trips easier. Available on Android and iOS. The Rapid Bus Guide – Find a Rapid bus stop near you by using the Ride Guide. Facebook – Like the City of Grand Rapids Facebook page to see additional parking updates. DASH routes will run Monday – Sunday every 8 minutes and follow the schedule below. All buses are wheelchair accessible! Disability Advocates of Kent County is conducting a review on the accessibility of LaughFest Venues. The Venue Accessibility Guide allows individuals with disabilities to get a better understanding of how to access LaughFest venues and amenities that are available. 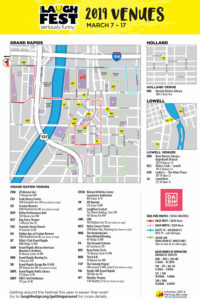 Check out this accessibility guide put together by Experience Grand Rapids for information on LaughFest venues and other attractions around town!